Hello all. I am new to the Android OS, I just signed up for Sprint with the Hero the other day. I gotta say I'm really liking it...coming from an Iphone. I am having one problem so far that is kind of annoying. I am getting duplicate notifications for my gmail account. For example, I get a message from "Sam" , in the notification bar, it shows two different icons - an envelope and an @ symbol -- for the same email. Anyway to get this changed? Also, was wondering, with the iphone, I could take "screenshots" of whatever is displayed on my phone screen, is this possible with the hero? Did you set it up in gmail or the regular mail app? If you setup your email in both gmail and mail apps then that may be why. As far as screenshots goes, if you root your phone there are a couple of apps that work great, I haven't found another way otherwise. Welcome to Sprint and Android!! Ahh yes that was my problem. I had my account somehow set up in both the gmail app and the HTC Mail app. Problem solved! Thanks! 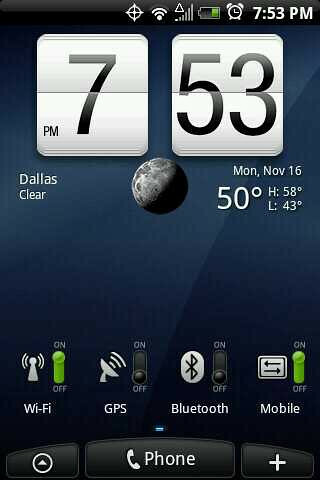 btw, here is a screenshot of my phone so you can see it can be done, phone just has to be rooted. Noj, I like the time display on your phone. How can I get that? Also, I have the same duplicate notification problem. I'm an amateur at all this (never had a touch phone before). I dont think I set up Gmail AND regular email icon on my Samsung Moment. How can I stop getting two? I dont see directions. Thank you.